I saw these skirts on The Long Thread a little while back and had to quiz Ellen on how she made them. Basically, you sew together the ends of a half-yard of fabric, hem and add an elastic waistband. Simple, fast and inexpensive - perfect for adding to a back-to-school wardrobe. For instructions (because I'm just not that good at "winging it", even with something this straight forward), I used the instructions for the Corduroy Skirt from the book Making Children's Clothes by Emma Hardy. The skirt in the book is a half-yard skirt like Ellen's, but embellished with ribbon, a pocket and accent fabric. I made this for my 9-year-old daughter, who didn't want any embellishments (by the way, the book only goes up to size 5. 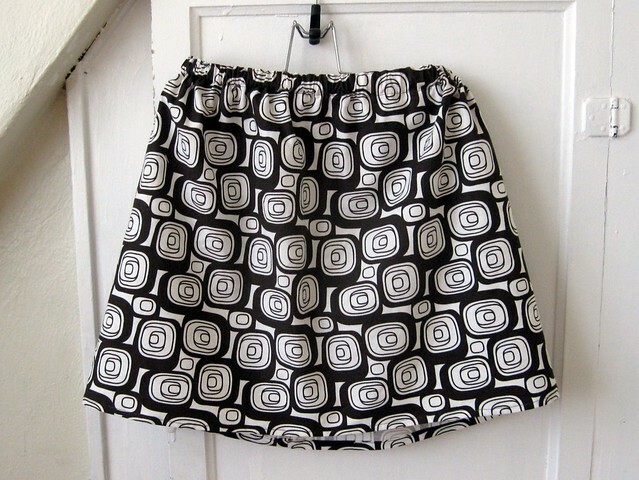 I knew I was making a short skirt with an elastic waistband, so measurements didn't matter much). I chose Hip Squares fabric from Daisy Janie's Geo Grand collection for several reasons. The chocolate brown is a classic fall color, goes with many items she likes to wear (mostly long t-shirts nowadays). It is also a fabric with a nice weight. It is not as heavy as home dec fabric, but definitely has more weight than a traditional quilting cotton. And, it has a beautiful drape with no stiffness. This was an important factor for my daughter, as she's one who really plays at recess and needs something that will withstand playground equipment. No dainty fabrics for her! I am pleased with the final result, my only caveat being that the elastic waistband is not quite as style-forward as a 9-year-old girl would like (causes a bit of a puff under the waistband). However, as stated before, her favorite tops are long t-shirts/tanks/sweaters/henleys so she would never tuck a shirt into this skirt. Therefore, the look of the waistband doesn't matter so much and she gets some added comfort along the way.